Growing Forsythias from cuttings is very easy and can be done nearly anytime of the year. Forsythia cuttings is a great way to expand your flower garden or share with friends and family. If you are looking to plant several forsythias to create a privacy fence or unique design then cuttings will be your best bet. It will be cheap, practically free, and will be an accomplishment you can be proud of. Cuttings can be taken any time during the growing season and will root very quickly. Cuttings taking during the dormant months will still root but will require more time to become established. Forsythia cuttings root well and are easy for beginners. They require very little maintenance and do not require special treatment. 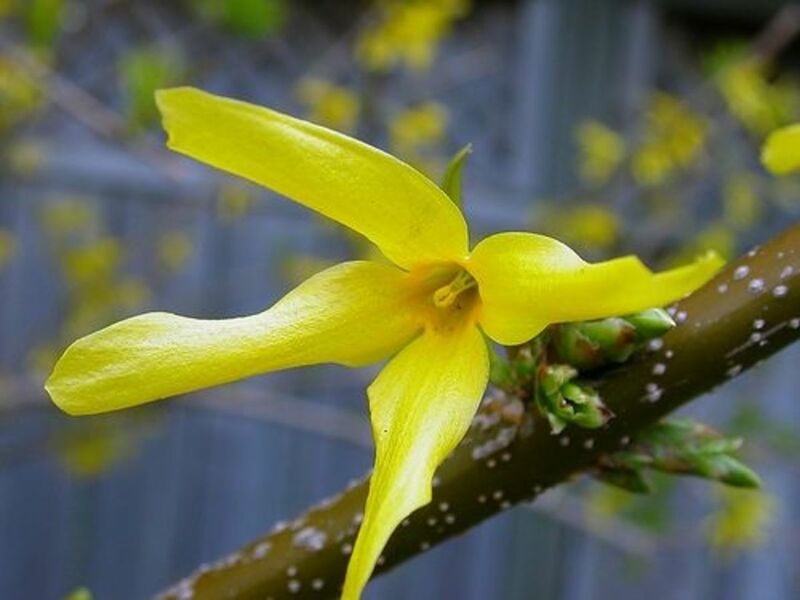 Here you will find everything you need to know to grow beautiful forsythias from cuttings. The first step to growing forsythias from cuttings is to prepare your pots and soil. 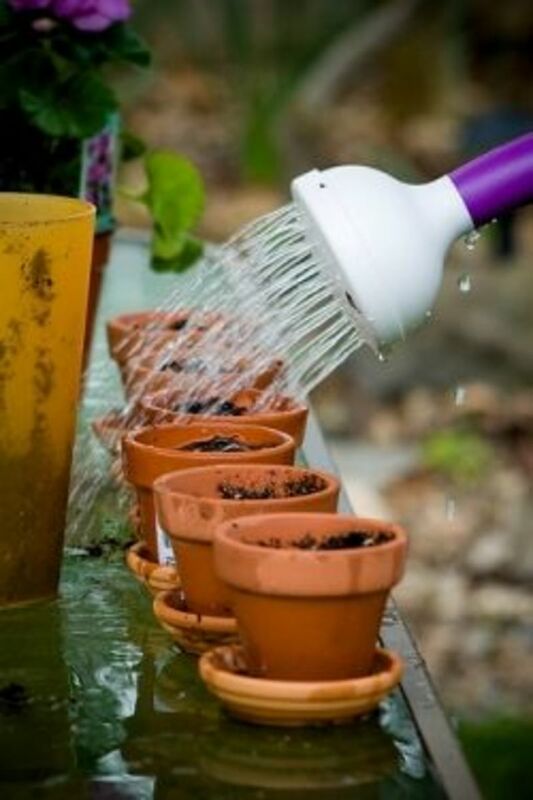 Start by filling you pots 1 inch from the top with fresh sterile potting soil. 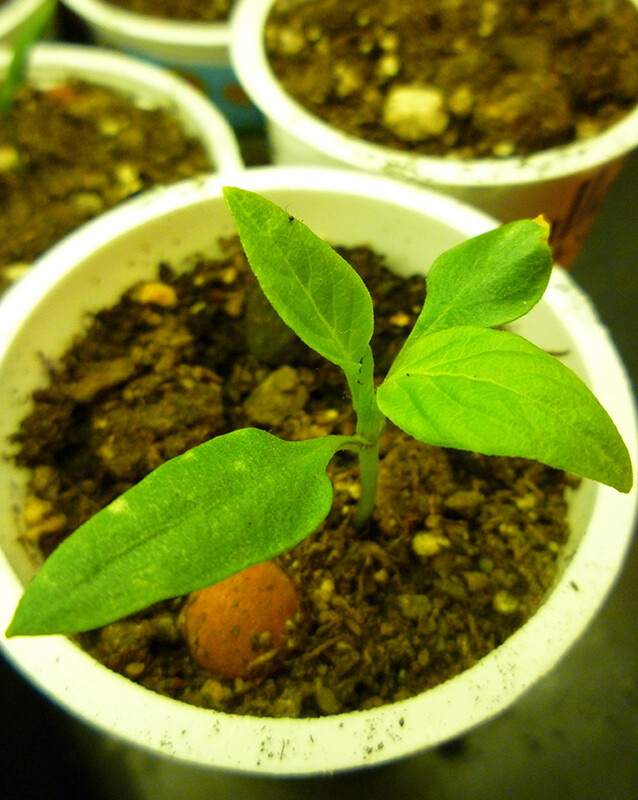 A mixture of perlite and peat can also be used. Once your pots are filled with soil water them thoroughly and allow them to drain. After the soil has drained completely water them again. Set the pots aside and take your cuttings. Using a healthy forsythia plants you will want to take cuttings from semi-hardwood, hardwood, or fresh green growth. Use sharp shears and make a clean cut at an angle. This will prevent damage from the parent plant and also the cuttings. 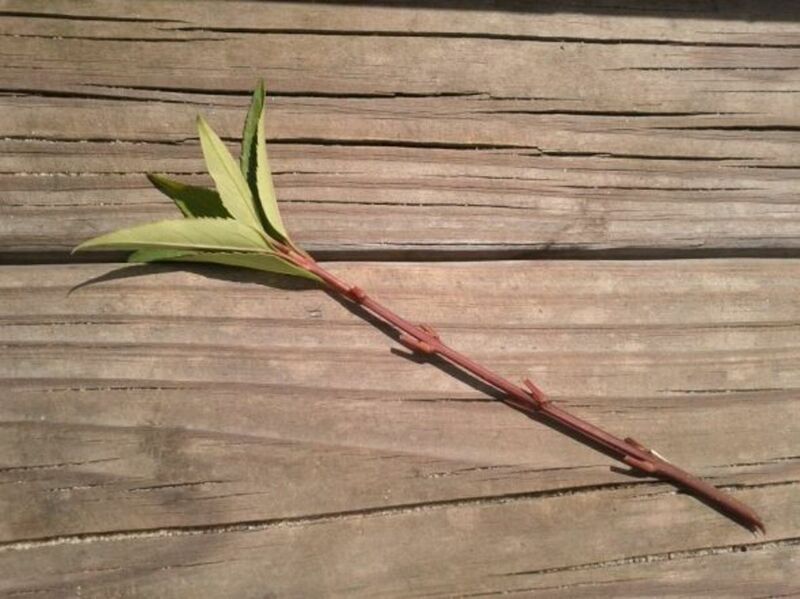 Cuttings should be 4 to 8 inches long and no thicker than the size of a pencil. Cuttings can be taken from the tips or from long whips cut into sections. Insure that the sections are cut so that there is a set of leaves near the top of the cutting and at least one nodule near the bottom portion. After forsythia cuttings have been taken they will needed to be planted immediately or placed in a glass of water, moist paper towels, or other cool, wets source that will keep them safe until they are ready to be potted. Forsythia cuttings need to be prepared prior to planting. 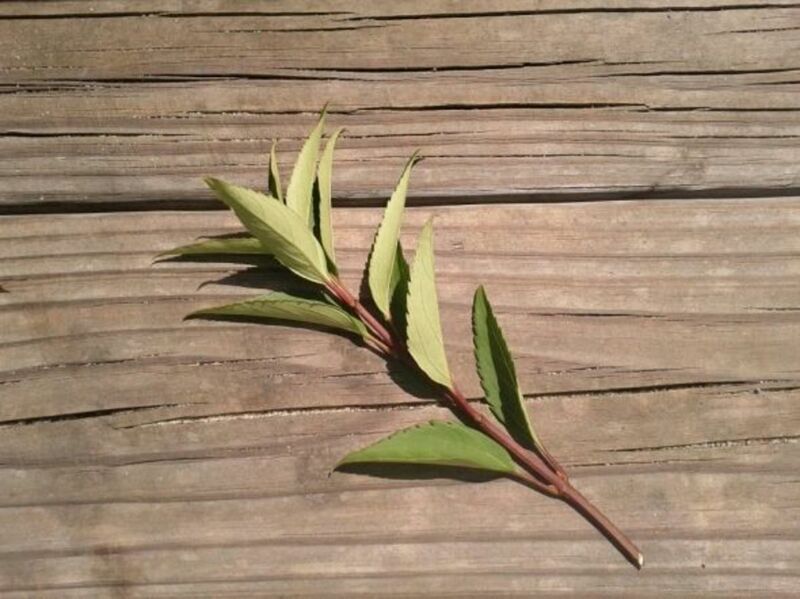 All leaves need to be cut back except for the top 2 or 3 leaves. Remove any branches as close to the main stem as possible. Cutting back all the unnecessary foliage will help the cutting retain energy and prevent moisture loss through the leaves. This is my forsythia cutting right after I cut it from the bush. This is the same forsythia cutting after I took the leaves off of it. I only left a few at the top. When propagating forsythias or any other type of plant it is important to have sharp pruning tools. Dull shears can crush the stems rather than cutting causing severe damage to the stem which may not be visible. Damaged can take on diseases, prevent water absorption and a list of other things that would prevent your cuttings from rooting. Using the prepared soil and pots from earlier, use a pencil to make a small hole in the soil. After holes are made place a single cutting in each hole and gently firm the soil around the cuttings. Rooting hormone can be used but not required. You can place a single cutting or place multiple cuttings in the same spot as long as you allow 3 inches in between each cutting. Overcrowding will prevent airflow and cause the tender roots to be tangled and damaged when separated. Once the forsythia cuttings have been planted water them thoroughly and allow them to drain. Place cuttings in a protected area that is shaded from direct sunlight. A greenhouse is optimal but not required. A nice shade tree, awning or other protected area will do just fine as long as the cuttings are protected from hot, scorching sun. Until your forsythia cuttings have rooted they will need a little TLC. 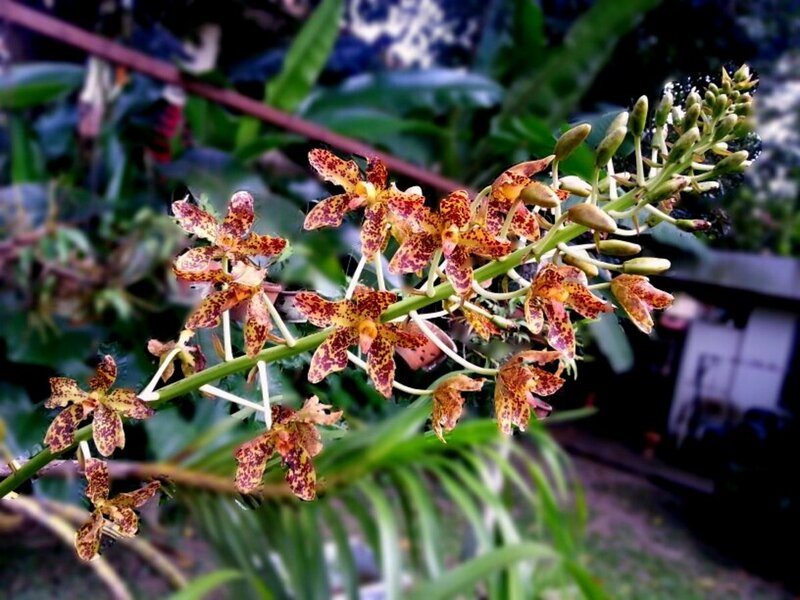 Check them daily to insure the soil is moist but not soggy. Do not allow the soil to dry out between waterings. Doing so can kill your cuttings before they have the chance to root. If you notice the leaves are getting dry or brittle insure that the soil is staying moist and move them to a more shaded area. Sometimes the leaves will dry up so do not panic. Just take the extra precaution of moving them to insure they are safe. Do not pull on your forsythia cuttings to see if they have rooted. Doing so will tear the roots loose and damage your cuttings. Wait for signs of new growth. If you are like me and must know, you can give the cuttings a gently tug and see if they feel snug. If they are getting snug there is a good chance they are starting to root. 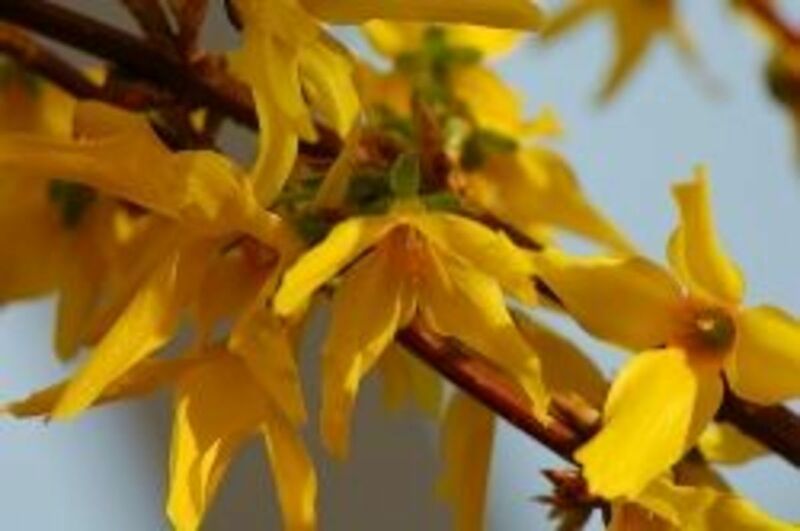 Forsythia cuttings should root in 2 to 3 weeks from new growth and 6 to 8 weeks from dormant cuttings. This forsythia cutting is about 8 weeks old. It has obviously rooted due to all the new growth. Not only has it put on new leaves but also new branches. Once your forsythia cuttings have been rooted they will need to be fertilized using a general purpose liquid fertilizer. Mix the fertilizer according to the package directions at half strength the first time you apply it. After that, they can be fertilized at full strength according to the directions. 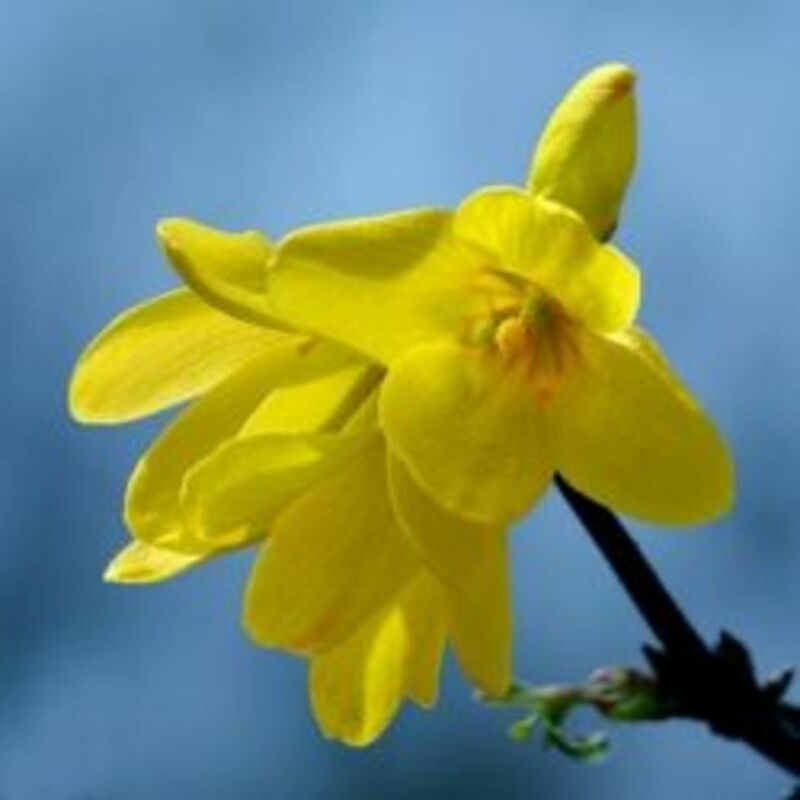 Once your cuttings have rooted and become actual forsythia plants they can be planted out into the garden. You will need to harden them off prior to planting them in full son to prevent them from being scorched. 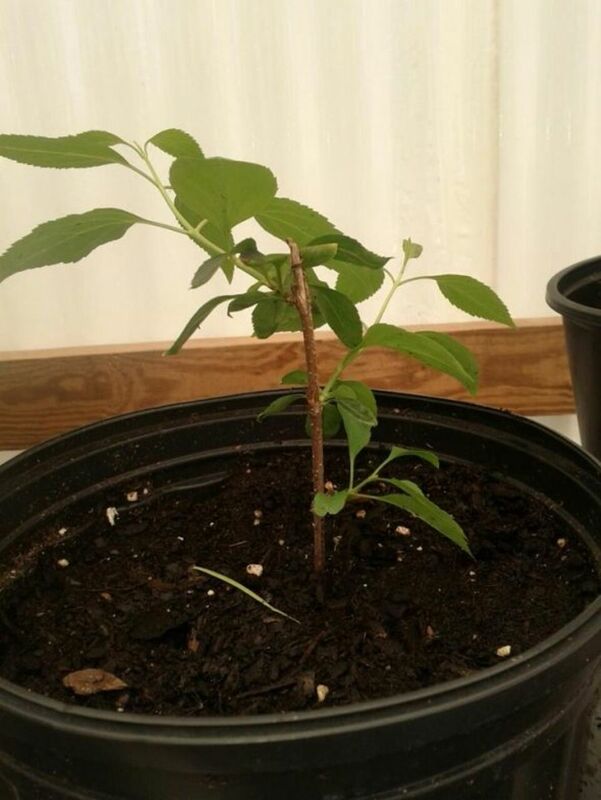 To harden off your rooted cuttings place them in direct sun for an hour or two the first day and gradually add more hours of sun each day until the plant can handle full sun the entire day. Make sure you keep the soil moist as it will begin to dry out quicker in the full sun. Once the rooted forsythias have been hardened off they can be planted in your garden. They will need to be watered daily to help them adjust and prevent shock. 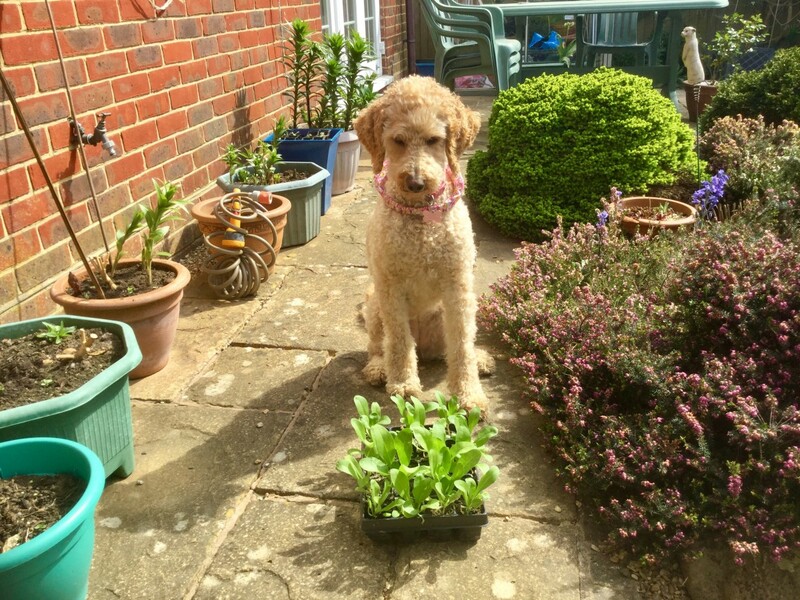 You will need to protect them the first winter if you have planted them out in the garden the same year you propagated them. Mulch can be used to prevent them from freezing and being damaged their first year in the ground. Anytime you prune your forsythia you can use the stems that have been pruned to create new forsythia bushes. Gardeners, plant collectors, horticulturists, and landscape designers will find a valuable resource in this carefully selected plant directory of best performing winter-flowering shrubs. Readers will find daphnes, forsythias, viburnums, witch hazels, and camellias to suit every taste and garden situation, as well as information about how to help their choice winter-flowering shrubs flourish from November to March. In three sections - design, plant profiles, and care - this handbook covers every essential consideration of tree and shrub gardening. After an introduction to the principles of garden design, O'Sullivan guides readers through tree and shrub selection, with special considerations for owner expectations and growing conditions. What Are Your Thoughts on Growing Forythias from Cuttings? Your article is very detailed and helpful. It looks easy and I'm going to give it a try. Many thanks. I haven't grown forsythias from cuttings, but many other plants - makes gardening a lot cheaper, and is dead easy! I want to try this. I love forsythias and lost a huge one in our house fire but have two younger ones (a few years old now) in a different part of the yard. If I can grow cuttings from those to plant in the back, that would be just awesome. Thank you for the great information!